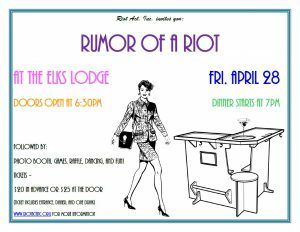 Rumor of A Riot ~ A Fundraiser Event – Riot Act, Inc.
Jackson, WY – Riot Act will be hosting Rumor of a Riot, a 1980s dinner party, game night, and dance party, Friday, April 28, 2017 at The Elks Lodge. Doors open at 6:30pm and dinner starts at 7pm. Dress in your favorite 1980s upper class duds. Enjoy dinner with make-your-own pizzas and a special dessert. After dinner, join the game stations or jump in the photo booth. Win entries to our raffle at each station. Raffle prizes include a gift certificate to Fine Dining, original artwork, massage certificates, and much more. Watch a short preview featuring the cast of our upcoming production: Rumors by Neil Simon. Everything will culminate in a DJed 80s dance party. Doors open at 6:30pm. Dinner starts at 7pm. Games, Raffle, and Dancing to follow. 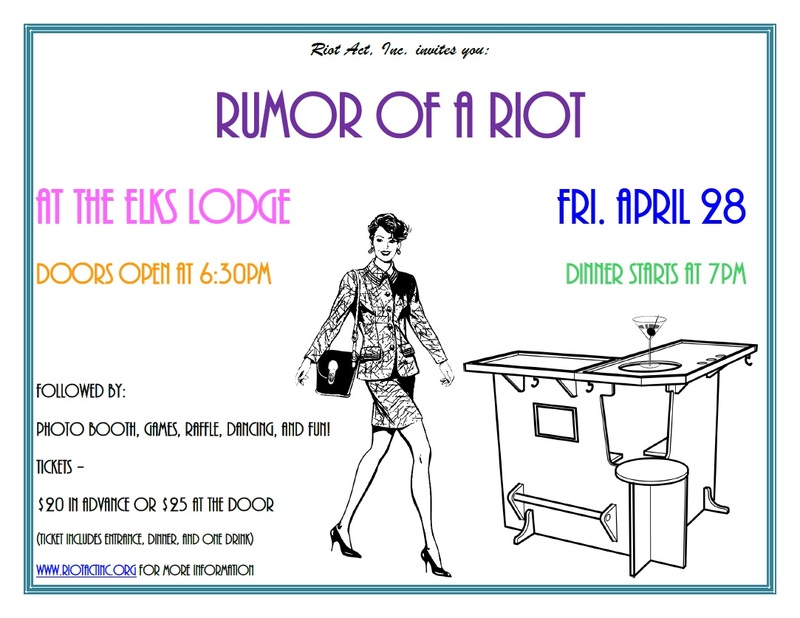 Tickets are available in advance at www.riotactinc.org for $20 or at the door $25. Ticket price includes dinner and one drink. Game and photo booth tickets will be available for purchase during the event. Proceeds from this fundraiser event will help us to match a matching grant from the Community Foundation of JH and produce both Rumors and our Annual Series of Shorts.